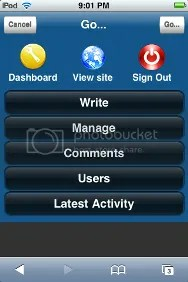 I just came across a great plugin-Wphone which allows you to access your wordpress admin panel in your iPhone. 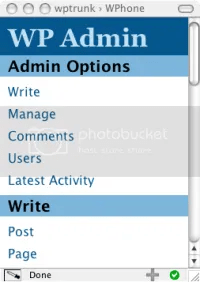 WPhone allows you to use a custom admin interface while interacting with your WordPress install via your phone. 3. Log into your admin panel and activate the plugin. When logging into your account, check the checkbox marked “Use mobile admin interface” on the login form to use the mobile admin interface. The app gives non-Buzz users a taste of what the service is all about by letting them tune into Buzz conversations in their local area without logging into the service. Once logged in, however, avid Buzzers can start conversations, or join in with their followers. As with the mobile web app made available at launch by Google, it’s possible to mark your Buzz as private or public and decide whether you wish to publish your location, which is selected by the iPhone’s GPS. If you spot someone new and interesting having a conversation with someone you follow, it’s easy to grab their details , who they are following and a chronological list of their Buzzes. If you decide to follow them, you can do so with a single click. 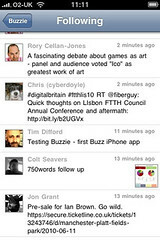 On the home screen you have the option of viewing your own Buzzes, in the same way that you might view your Twitter timeline in on of the many third party Twitter apps. Photos and other attachments are quick and easy to view within specific Buzz messages and are quickly saved to the iPhone’s photo album. As with the web app, you can also search for people to add to your Buzz following list. In short, Buzzie is simple, straight forward and slicker than the mobile web app. Doubtless Buzzie is the first of many Google Buzz apps, but for those iPhone users who have already caught the Buzz bug, take a look. During launch week there’s a third off the price – it’s available for £1.19/$1.99.